Welcome to The Elms Inn ideally located in Ridgefield Connecticut. The Elms Inn offers the best historical hotel in New England. The Elms Inn offers the best family activities and attractions in Ridgefield Connecticut. The Elms Inn is also the premier venue for weddings in Ridgefield Connecticut with its rich historical atmosphere. Stay with us at The Elms Inn, and you're sure to have a memorable New England vacation experience. The Elms Inn is a charming 1799 historic New England inn located on tree-lined Main Street in beautiful Ridgefield, CT. Nestled among 3 acres of grounds and gardens, The Elms Inn includes 19 period rooms, suites, and luxury suites as well as the four star Elms Restaurant & Tavern just steps from our door. 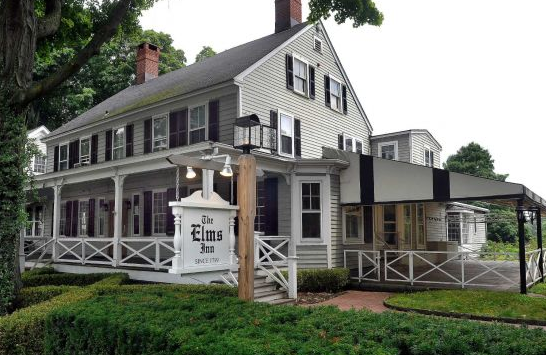 You will feel as if you took a step back in time at the historic Elms Inn, where our 19 rooms surround you with period charm as well as au courant conveniences. Within the 18th century masterpiece, no two rooms or suites are alike. Each room holds its own charm, from delicate linens, beautiful antiques, detailed woodwork, and a timeless atmosphere. All rooms feature complimentary Wi-Fi high speed Internet access. Best of all, our guests are treated to a delightful, complimentary breakfast delivered to the room every morning.